Serving the communities of Ogontz and Belfield, this branch is located at Church Lane and Ogontz Avenue. Ogontz is named after the Oak Lane mansion of Jay Cooke, a Civil War financier. As a young boy, he met Chief Ogontz in Ohio and later named his home for the Indian leader. The community first requested a library in 1961, but due to problems with sites, funding and construction, the library was not opened until 1997. David and Florence Cohen helped get the community organized by circulating petitions and even hosting a meeting at their home. In the 1960's and 70's the area was served by a bookmobile, and various sites were considered, and even purchased, but the plans were rejected and funding was rescinded. 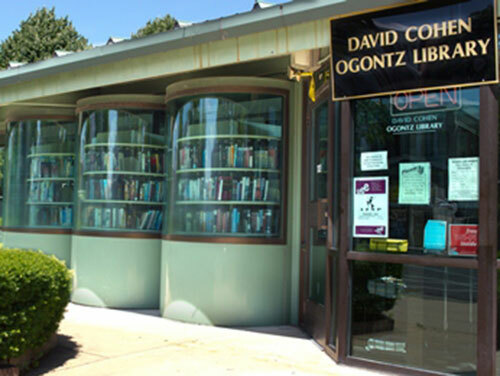 In 1984, the neighborhood association requested a library on the site of the former Ogontz Theatre and the library applied for library construction funds from the state. In 1994, groundbreaking was held at 6017 Ogontz Avenue, next to the site of the theatre. The library was to be a pre-engineered modular building, with carousel book shelves. On February 10, 1997, the new library was finally opened, with a special poem written and recited by Nikki Taylor, who fondly remembered the weekly bookmobile visits and considered the new library a blessing for the entire community. The preschool area features a yellow Corvette with children's computers - to help the youngest get on the Information Superhighway.